The unfortunate reality is that you can lose new hires as quickly as you hire them. This is a problem when you take into consideration the cost of hiring and onboarding that new employee - costs you will incur twice over if you lose a new hire and have to begin the recruitment and hiring process all over again. Half of all hourly workers leave new jobs within the first 120 days. 16% of annual salary for high-turnover, low-paying jobs (earning under $30,000 a year). 20% of annual salary for mid-range positions (earning $30,000 to $50,000 a year). Up to 213% of annual salary for highly educated executive positions. Solution? Make sure your recruiting and onboarding messaging aligns with your company culture so that new hires understand what's actually in store for them at your organization. BambooHR recently released a survey in which 76% of respondents agreed that on-the-job training during onboarding is the most important thing a new employee needs to get up to speed and begin contributing quickly. Using mentoring for onboarding provides this training in a personal way, allowing the new hires to gain an understanding of the organization through the eyes of a fellow employee. Changing jobs is like changing houses. Moving from one to the other is not easy, and you often find yourself at your new place wishing you were back at your old one. Mentoring relationships ease this stress and doubt by connecting new hires with someone who can relate to them. By allowing your new hires to help facilitate their own onboarding process, you are already encouraging them to become part of your team. Mentoring allows you to introduce your new hires to the culture of your company and replace their sense of doubt with a sense of belonging. The more quickly you align your new hires with the reality of your company, the quicker they can begin contributing to your mission. Make sure you clarify your expectations from the start so that your new hires aren’t misled. The best way to do this is through a formal mentoring program, which introduces the new hires to the company through the eyes of someone who has been in their shoes. Mentoring partnerships alleviate the initial stress of the onboarding process by opening up a line of communication that allows the mentee to be open about their questions and concerns about their new roles. In return, the mentor can offer advice on how they can make the most of those roles. Such dialogue creates a culture of honesty and understanding, which not only garners appreciation but also improves employee engagement and retention from the start. 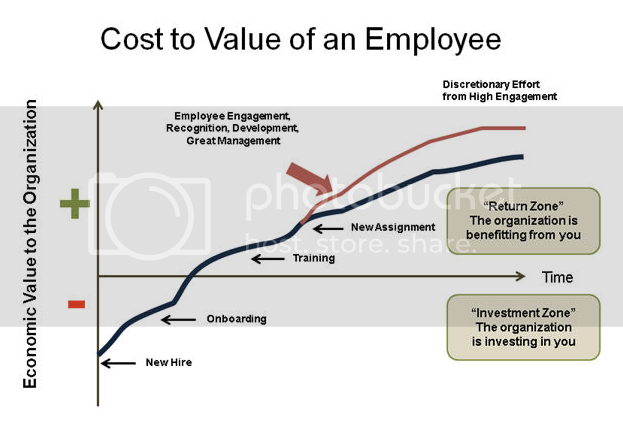 The onboarding process for a new hire is in the “investment zone” for an organization. Be sure you are making a good investment by situating your new hires in a role that they understand and accept so that they can work towards benefitting you in the long run. If you fail to structure your onboarding process correctly, then you could lose your new hire before you even gain a return on your investment. Creating an effective onboarding program not only promotes organizational goals, but also supports individual goals. This attention to career development gives the mentoring process a personal edge that an onboarding program without mentoring would lack. Don’t lose before you begin. Use mentoring to create an effective onboarding program to help you avoid the loss of your greatest assets. Learn more about how mentoring training can help your organization create an effective onboarding program.